Japanese Episode DP 052: "Tag Battle! The Finals!!" American Episode 1051: "Smells Like Team Spirit!" Outside the arena of the Tag Battle tournament, Satoshi offers Shinji's abandoned Hikozaru a slot on his team. Just as the monkey pokemon is about to accept, the Rocket-Dan appear and attempt to kidnap it! Hikozaru is able to send the trio blasting off, demonstrating its awesome power in the process. With the pokemon thieves taken care of, Hikozaru accepts Satoshi's offer and joins his team. The next day, a match between the Takeshi-Honoka team and the Satoshi-Shinji team is held. Honoka's Kamonegi is quickly taken care of by Shinji's Dodaitoise, leaving Takeshi and his Gureggru to finish the match. Gureggru is able to do some major damage to Shinji's pokemon by using its small size to its advantage, but it is eventually defeated by a Leaf Storm attack. 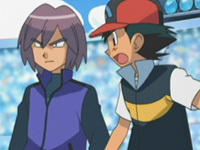 The tournament progresses, and before long, the final battle between Hikari's team and Satoshi's team begins. Satoshi chooses his newly-caught Hikozaru while Shinji goes with his Elekid while Hikari and Kouhei choose Buoysel and Heracross, respectively. The match starts with Hikari and Kouhei using a plan they had thought up earlier to gain the upper hand, and for a while it looks like Satoshi and Shinji are going to lose. However, Shinji's Elekid evolves into Elebuu, turning the tide of battle in their favor. Elebuu and Hikozaru win the match through sheer power, earning them first place in the competition and the coveted Soothe Bell. After the tournament is drawn to a close, Shinji gives Satoshi the Soothe Bell that he was given, saying that he doesn't have any use for it. Now that our heroes have finished everything they've set out to do in Yosuga City, they set their sights to Tobari City, home of Satoshi's third gym challenge. The end of Diamond & Pearl's first mini tournament is here, and I think it's a pretty decent way to end the series' first year. We get some nice battles, Takeshi's Gureggru proving how awesome it is once again, a pokemon evolution, Hikari and Kouhei sticking to their well thought-out battle plan (though it is pretty obvious that Kouhei's the one who was calling the shots there) and, of course, Hikozaru's debut battle with Satoshi. The only thing I really didn't like about this episode was how Honoka just up and left without a good-bye or anything. Especially when the result is seeing Takeshi standing alone in the audience, talking to himself like some pitiful, friendless crazy person. I also thought that random Potchama-falling-down-comic-relief at the end of the episode was a bit ridiculous. Nothing too remarkable to report, edit-wise. Though I do wish Pokémon USA would stop making up stuff when it comes to how often these competitions take place. The Japanese version has pretty much avoided saying how often certain tournaments and competitions take place for quite a while now, but the dub continues to assert that these things happen once a year. While I doubt PUSA's changes will really have any effect on the plot at all, it's still an annoying change that doesn't really need to be taking place. Elebuu keeps its Japanese voice. The cold opening is missing from my copy of the English version of this episode (which would have been taken from the premiere airing when all three episodes were strung together to make a "movie"), but I assume that it's been restored for any subsequent airing. I just thought I'd bring it up here just in case it wasn't brought back for whatever reason. This one's a nitpicky one, but since I don't really have too much else to talk about with this episode, I figured I'll be OK. In the Japanese version, Takeshi tells Honoka that he used to be the Gym Leader at the Nibi City. Brock says the same thing in the dub, pretty much, except he doesn't mention the name of the gym he was a Gym Leader at. Enta: "And there you have it. The victory in this year's Hearthome City Tag Battle competition goes to Ash and Paul!" Enta doesn't imply that the tournament occurs only once a year in the Japanese version.